Turn a Small Plot of Land into a Productive and Thriving Metropolis! Put on your helmet, lay out your blueprints, and make sure that there are enough sandwiches for your construction crew. You are about to put together the biggest city to ever fit on a palm-sized screen. Megapolis is by far one of the deepest and most complex city-building games you can find on the market today. Little by little, you will expand your city until it has buildings that number in the hundreds and a population that goes well into the thousands. Gather the resources to make it happen, ensure that there is enough power and water to go around, and turn a profit with dozens of different business ventures. Megapolis has it all. The only question remaining is: do you? Every mighty tree starts out as a small seed. 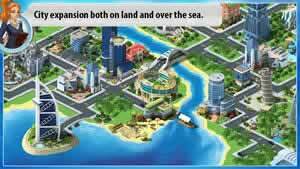 Your personal city in Megapolis is going to have a similarly humble beginning. Although growing a vast metropolis from a small plot of land and a handful of funds might seem to be an insurmountable task, it will get easier over time as you get progressively richer and more experienced. Keep at it; you will be amazed at how fast your city will grow. Features lush and incredibly detailed visuals. Set up houses to give your residents a place to live. Build dozens of legitimate businesses to draw in revenue for your city-building needs. Establish restaurants, hotels, shopping malls, airports and more. Build an interconnecting system of roads that allow for people to get from one end of the city to the other safely and easily. Construct turbines, power plants and water towers to provide your city with enough power and water for each and every new building you put up. Gain levels and acquire experience through normal play to unlock even more exotic buildings. Earn rare Megabucks. Use them to accelerate the construction rate for buildings. Watch the city bustle with life. Citizens go about their daily lives and cars drive up and down the streets. 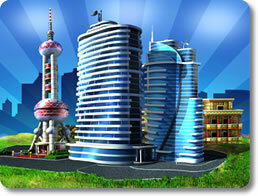 You will be hard-pressed to find a better sandbox game for a mobile device than Megapolis. Few other city-builders give you as much choice to build and design your city as this one. However, if you’re the type of person who likes to have a little bit of direction, then never fear! You can earn a good amount of money and experience by accepting a steady stream of jobs. These jobs will give you a few pointers in what areas your city may be lacking in, and will help ease you into the experience at your own pace. Pace yourself wisely. Some quests have a deadline. Build an aquarium that houses dolphins. Get a hexagon skyscraper into your city. Upgrade all your available flight services to gain air superiority. Building a city from your smartphone while you’re commuting to work is great and all, but what if you want to get to it while you’re at home? You could continue to work from your phone if you like, but you don’t have to. Unlike many games on the market, Megapolis fully supports cross-platform gameplay. Play the same game on as many computing devices as you like! Manage your city from your favorite mobile device or from any personal computer that is connected to the internet. Play your saved game on either Facebook or Social Quantum’s official network. Fully supports touchscreen and mouse-operated controls. It does not get any better than this. Megapolis is one of the most beautiful looking city-building games you’re going to come across period. It does not matter what the platform is because you can play the same game from your browser just as easily as from your Android or iOS device. Not only that, but it’s also one of the most open games out there. The city is your personal sandbox; how it looks, how everything in it is laid out, and how it makes money are yours to call. Get a plot of land and start building a Megapolis of your very own right now.